Playing the role of Ms. Cambodia in the upcoming United Nations Day 2012 costume event in your school? 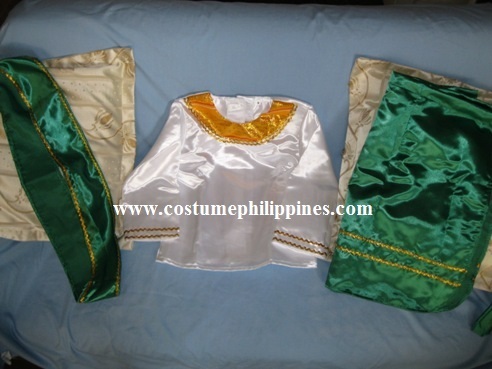 Here’s good news as we now have the complete set of the outfit available here at Costume Philippines. It is also available now for rent, sale and customization options. Also made from satin fabric, our Ms. Cambodia attire is available in 3-piece set – blouse, skirt and sash. We will include a small flag that your kid can carry in the program. Plus get it at a lower tag price if you buy the complete set. Price for the complete set is Php 649.95. Available in all sizes for kids / children both boy and girl for Mr or Ms Cambodia UN yearly celebration program. You can have us make a size from prep students up to high school. We can also make custom size for adult as per request only and quotation. This outfit may be ordered in separate items – blouse, skirt or sash only and may be customized in two options, the low cost or cheap materials and the high end while colors of each outfit may be altered to your preference for a touch of custom idea. (See Pricing Below). No hidden charges! It is more costly to buy in separate costume so we strongly suggest that to be able to take out the price difference, go buy our full 3-piece package of the Mr or Ms. Cambodia attire for your school celebration. For rent needs, custom costume needs and ideas, please call or text us at 3663645 / 0932 8725532 (Sam) / 0932 4962980 (Lori) / 0927 3125532 (Ana) or visit our home office in Caloocan City – 136 Bayani Street near R. Papa. For complete guide on how to get to our home office, please click HERE. We require 50% payment (non refundable) before any deliveries or pick up is made on any of our costumes so please see first what you are buying. We suggest that it is best if you come over in person. Otherwise, you will have to completely rely on our photos here on our website of the UN costumes. Paid and sold items cannot be returned because we don’t stock up items. Our tailors get paid for every order you make that we deliver so please avoid paying without trying to see what we sell in actual appearance. What you pay is what you get. You can pay via bank if you wish not to come over in our home office but again, we don’t allow refund for all or any of our products and services. Shipping and delivery for outside Metro Manila is accepted but will be charged accordingly as per LBC, DHL package sending fees and charges. On the other hand, deliveries in our ALLOWED PICK UP POINTS (Metro Manila ONLY) is absolutely and 100% FREE! This entry was posted in Occasions and tagged cambodia national costume, cambodia un costume, mr cambodia, ms cambodia, un cambodia, un day 2012, united nations day cambodia costume. Bookmark the permalink.